Meet Greta Helsing, fast-talking doctor to the undead. Keeping the supernatural community not-alive and well in London has been her family's specialty for generations. Greta Helsing inherited the family's highly specialized, and highly peculiar, medical practice. In her consulting rooms, Dr. Helsing treats the undead for a host of ills - vocal strain in banshees, arthritis in barrow-wights, and entropy in mummies. Although barely making ends meet, this is just the quiet, supernatural-adjacent life Greta's been groomed for since childhood. Vivian Shaw’s Strange Practice has just about everything I look for in a modern, urban fantasy. 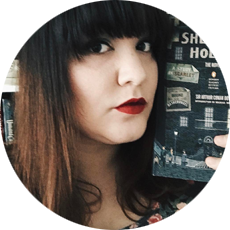 Dr. Greta Helsing (a descendant of those Van Helsings) is a GP to the supernatural inhabitants of London – vampires, vampyres (there’s a difference), demons, ghouls, mummies, werewolves, you name it. When the story begins, Greta is doing a house call and she finds out there has been another attack in a string of murders involving a weird religious sect. Through the developing arc of who, or what, is behind the Rosary Ripper murders. Shaw develops Greta’s London throughout the story, and I loved reading about all of the supernatural beings she encounters, treats, and cares for. Each type of being has their own social hierarchies, and I really enjoyed the fact that Greta has to rely on her knowledge of mythology, folklore, and the like, along with her shared family history, in order to figure out her patients’ symptoms and probable cures. Maybe it’s me, but I think it’s rare to find a female protagonist who isn’t in her twenties in urban fantasy these days, and I liked that she was slightly older than the typical protagonist and was slightly stiff and reserved around other people until she became familiar with them. There’s a little bit of a budding infatuation, but I liked that this was mostly focused on the relationships Greta has with her friends and colleagues. Romance is nice, but it’s better to have a core set of people to rely on and trust when things go terribly, terribly wrong. She truly cares about her people, and her people care about her. And if you love London and aren’t there now, this book will make you long to be back on those winding streets and wandering through those dark alleys on a cool night. As soon as I started reading this, I felt like I was transported right back to that city, and I felt like I could trace the routes these characters took in map I have in my mind. It felt real, it felt wonderful, and it made me wish I could go back just to see if I could catch a glimpse of the others hidden in the shadows. 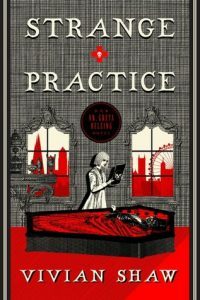 Strange Practice is a thrilling romp through the London we think we know with a fantastic set of characters that will keep you hooked until the very end. Thank you to Orbit and Netgalley for a review copy! All opinions are my own.